Dr. Kristina Boerger, Augsburg University’s inaugural John N. Schwartz Professor of Choral Leadership and Conducting, received her formative training from pianist Annie Sherter and holds the doctorate in Choral Conducting and Literature from the University of Illinois. 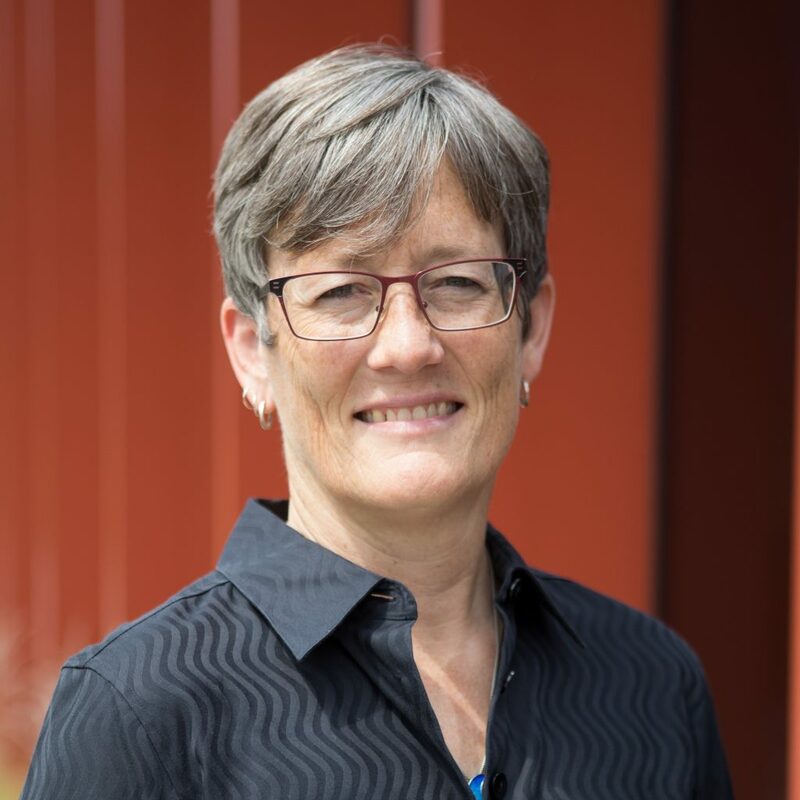 She has directed independent choirs in Urbana-Champaign and New York City, public-school choirs in Wisconsin and Illinois, and the choral programs at Carroll University, the University of Illinois School of Music, and the DePauw School of Music. Students under her direction have performed at the Obama White House, appeared in concert with Nine Horses and with ETHEL, toured programs of ancient and newly commissioned music through France and Italy, immersed themselves on location in Black South African choral communities, and shared global harmony traditions with inmates of the Putnamville Correctional Institute. Dr. Boerger’s guest conductorships include the Rose Ensemble, the Madison Early Music Festival, the Kalamazoo Bach Festival, the Syracuse Schola Cantorum, the Chicago Children’s Choirs, the Christopher Caines Dance Company, Alarm Will Sound, and Chanticleer. She has served as conductor/clinician/adjudicator at festivals throughout the United States, in Quebec City, and in Mar del Plata (Argentina). As a soprano she concertizes regularly with the Manhattan-based Renaissance ensemble Pomerium and with Manhattan’s Vox Vocal Ensemble, also enjoying a spot on the touring roster of The Rose Ensemble of Saint Paul. Boerger’s self-published choral arrangements are widely performed, and her treble-chorus settings of poetry by Sarah White are published by Boosey & Hawkes. Her SSATBB setting of Yeats’s “The Second Coming” was commissioned by The X24 Chamber Choir of York, UK. Boerger served nine years as Artistic Director of the Cerddorion Vocal Ensemble, one of New York’s most highly regarded volunteer choirs. With this group she commissioned several new works, performed at the 2006 Eastern Divisional Convention of the American Choral Directors Association, collaborated with the Christopher Caines Dance Company, and recorded on John Zorn’s new-music label Tzadik. Also in New York she served three seasons as Music Director of AMUSE and two seasons conducting the Collegiate Chorale. All three groups under her direction received critical acclaim in the New York Times, whether for performing early vocal polyphony, contemporary chamber works, Baroque opera, or nineteenth-century symphonic choral repertoire. As a New-York based singer in a variety of styles, projects, and ensembles, Boerger toured, recorded, and coached for nine years with the Western Wind sextet; since relocating to the Midwest in 2009 she has continued as a member of Pomerium and Vox and enjoys accepting other ad hoc engagements as her academic schedule allows. Other recording credits include projects with Bobby McFerrin, Early Music New York, Rocky Maffit, and Pan Morigan. She appeared in the acclaimed 2006 and 2009 runs at the BAM (Brooklyn Academy of Music) Harvey Theater of Sir Jonathan Miller’s semi-staged Bach Saint Matthew Passion. Throughout her years in New York, Dr. Boerger lectured in music history at Barnard College, also mentoring senior music research fellows. From 2005 through 2009 she taught the undergraduate and graduate courses in choral conducting at the Manhattan School of Music. She also co-taught a summer graduate course at Columbia University comparing oral and written literary and musical forms as consolidators of cultural identity. Boerger’s work in the 1990s as Founding Director of AMASONG: Champaign-Urbana’s Premier Lesbian/Feminist Chorus is the subject of Jay Rosenstein’s acclaimed documentary The Amasong Chorus: Singing Out, which was produced with grants from the Corporation for Public Broadcasting and the Independent Television Service. The film toured festivals worldwide before enjoying its US national broadcast debut in June of 2004. With AMASONG Boerger directed two award-winning recordings (Over Here the Water is Sweet, 1998 GLAMA for Best Choral Performance; AMAI, 2000 GLAMAS for Best Choral Performance and Best Classical Composition), performed at several national venues, and toured the Czech Republic. AMASONG’s performance project with Zimbabwean traditional song and dance artist Patience Mudeka catalyzed Boerger’s dissertation research. “Whose Music Is It, Anyway?” Black Vocal Ensemble Traditions and the Feminist Choral Movement: Performance Practice as Politics explores racial and gender identity construction through choral performance and examines racism’s impact on White and Black performers’ beliefs about authenticity, ownership, and theft of oral-tradition materials. A member of the editorial board of the Choral Journal, Dr. Boerger is the guest-editor of the October, 2018, special-focus issue, Choral Communities and Social Justice. In recent community organizing efforts, outreach projects, and invited workshops – and extending her work as a faculty artist with Urban Bush Women’s arts-engagement institute A New Dancer for a New Society – she continues to explore shared singing’s power to unite individuals in healing community and to bolster those communities for effective social and political action.